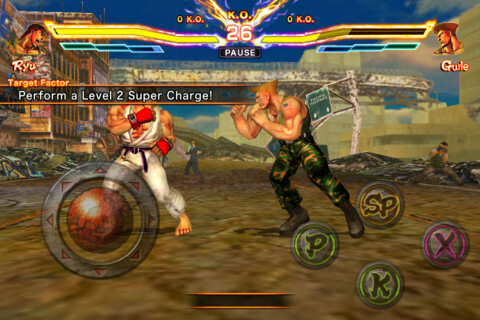 In a move to help drum up interest for Street Fighter X Tekken Mobile, Capcom released a free-to-play mini-game of sorts for iPhone and iPad called Street Fighter X Tekken Gauntlet. Featuring the same engine and graphics as its counterpart, this limited title comes with a single mode that challenges players to defeat as many opponents as possible with either Street Fighter's Ryu or Tekken's Kazuya. If this is the publisher's way of tempting us to buy the more fully featured $0.99 beat-em-up, it failed miserably. To be fair, the concept sounds intriguing, and we've certainly enjoyed a few Gauntlet modes in fighting games past. This one, unfortunately, misses the mark. For starters, it randomly chooses Ryu or Kazuya, preventing players from making the decision on their own. Then it forces users to pull off assigned objectives to add time to the clock (30 seconds to start), except the controls are dreadful. The virtual arcade stick is at times unresponsive, which makes achieving those aforementioned targets more difficult than necessary. The fact that it doesn't float wherever we place our left hands is a pain, and the overall action is much too jerky to enjoy. On top of that, Capcom placed the text for these goals on the middle left portion of the screen, obscuring the play field. The visuals, meanwhile, disappoint. Character models look decent enough, but the blurred ground and lackluster scenery don't highlight the powerful fourth generation iPad and iPhone 5 displays. 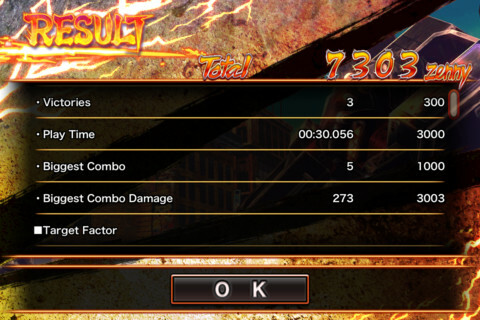 All of this makes Street Fighter X Tekken Gauntlet quite forgettable, we're afraid. There's little to no redeeming value, and that being the case, we promptly deleted it from our "i" devices. What's Hot: You can quickly delete it. What's Not: Only two playable characters, lackluster arcade stick, moves are too difficult to pull off, unimpressive visuals.